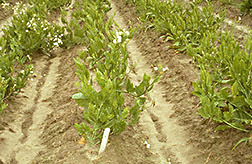 In time, synthetic insecticides from sugar esters will likely be commercialized and may be valuable for insecticidal use on flowers and ornamentals in the greenhouse, field, or nursery. It took more than two decades and involved milestones of scientific discovery by more than five ARS scientists and their cooperators. Now, a new class of insecticidal compounds is being introduced that offers a safe and effective alternative to conventional chemical insecticides. They are based on a family of compounds named “polyol esters,” which are sugar esters. The best of them would provide relief to agricultural crops, household and garden plants, and even honey bees embattled by a variety of pests. The latest chapter in the saga of bringing such compounds to market involves the efforts of entomologist Gary J. Puterka while working at ARS’s Appalachian Fruit Research Station in Kearneysville, West Virginia. Puterka is now with another ARS unit, in Stillwater, Oklahoma. Puterka began researching the insecticidal activity of natural and look-alike, or synthetic, sugar esters more than a decade ago. His work grew from earlier research by ARS scientists in Beltsville, Maryland, who discovered a family of natural sugar esters that act as repellents to insects. The Beltsville scientists had analyzed natural plant compounds taken from leaf hairs, or trichomes, of wild tobacco plants. Such hairs serve as a protective armor for plants because they secrete polyol ester chemicals that are deadly to certain insect pests. The insects become contaminated when they rub against and chew on the hairs. As a group, sugar esters are internationally approved as food additives. But the polyol sugar esters that the scientists have been working on are based on different fatty acids and different sugars than those that are commonly and safely used in foods and cosmetics. For years, ARS scientists have been trying to unlock the secrets to insecticidal compounds found naturally in wild tobacco plants. They eventually determined that sugar esters were the key. Recently, they’ve patented two new synthetic sugar esters that may eventually be marketed. The Beltsville researchers first patented the compounds they found, but those natural sugar esters turned out to be too expensive to mass-produce as insecticides. Later, ARS scientists in Athens and Tifton, Georgia, devised and patented synthetic versions of the natural sugar esters. They were more suited for mass-production but proved less potent than their natural counterparts. More recently, while working under a cooperative research and development agreement (CRADA) with industry cooperators, Puterka identified more active forms of sugar esters that are easier to manufacture. One of the reasons the new synthetic sugar esters are unique among insecticides is that they kill rapidly and do not leave a harmful residue on the surfaces to which they are applied. What’s left after application is inactive once it has dried, and it rapidly degrades to harmless sugar and fatty acids. The esters disrupt the physiological functions of the pest—but not the host. When sprayed on a plant or animal, the polyol sugar esters do not circulate within the host. Rather, they kill by penetrating, or breaking down, the insect pest’s outer waxy coating. The insect then loses water, shrivels, and dies from dehydration. The first synthetic sugar ester patent, in which Puterka was named as co-inventor, was awarded in 2002. He and his CRADA cooperators defined the effective chemical structure of the sugar ester, sucrose octanoate, and its method of synthesis. That compound kills certain pests on several substrates, or surfaces. 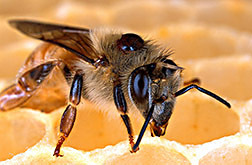 For example, the concentration of sucrose octanoate can be adjusted to selectively kill the parasitic Varroa mite on honey bees without harming the bee. The compound is now available in a product form that is well-suited for use by small honey bee keepers, but its labor-intensive application method is prohibitive to commercial beekeepers, according to industry experts. Sucrose octanoate is now registered by the U.S. Environmental Protection Agency (EPA) for a wide variety of insect and mite pests on agricultural crops, such as apples, citrus, cotton, grapes, and pears. The registration also covers the ingredient’s use to control pests on greenhouse and ornamental crops as well as on household and garden plants. Last year, Puterka was again named in a patent as a co-inventor of two new synthetic sugar esters. At least one of them—sorbitol octanoate—has proved to be less costly to produce than sucrose octanoate and is almost as effective. If sorbitol octanoate undergoes the lengthy EPA registration process, it could become the preferred chemical for use in future products. “These sugar esters are a new class of insecticidal chemicals but should, in time, be commercially available in several other markets,” says Puterka. When licensed, they’re likely to be a boon to the home and garden market for use as a safe insecticidal spray on plants, such as gardenias, to rid them of pesky aphids. They have also proved to be effective against whiteflies, scales, and psyllids.—By Rosalie Marion Bliss, Agricultural Research Service Information Staff. Gary J. Puterka is in the USDA-ARS Wheat, Peanut, and Other Cereal Crops Research Unit, 1301 N. Western Rd., Stillwater, OK 74075; phone (405) 624-4141, ext. 257, fax (405) 372-1398. 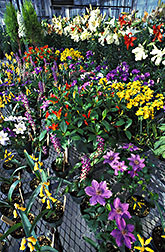 "Death by Desiccation: Sugar esters dry out insect pests of flowers and ornamentals" was published in the June 2005 issue of Agricultural Research magazine.